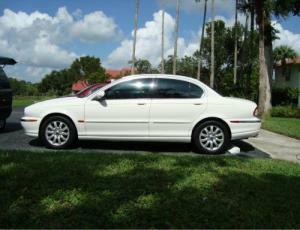 We lead the industry with the best auto window tinting service in Boynton Beach and the Delray Beach area. Our selection of Carbon and Nano automotive films are made with the utmost quality. Our Carbon and Nano automotive window tinting specialties are the perfect choices for all of your needs, whether it’s hi-grade heat-rejection, signal-friendly technology, or tinted windows with style and privacy. When you call John Barnes Window Tinting in Boynton Beach, you can be certain of two things: great looking windows, and absolutely no bubbling or peeling. The key to the John Barnes Window Tinting technique is our state-of-the-art “custom film cutting.” No matter your specifications, we guarantee an accurate cut for all tinting patterns—creating a perfectly customized window tinting installation. Custom cuts from John Barnes Window Tinting are made with laser-like precision, ensuring that perfect tint installations are always available for every customer in the Boynton Beach, Delray Beach, and Palm Beach County areas. For 25 years, John Barnes Window Tinting has provided top-of-the-line auto window tinting in Boynton Beach for cars, trucks and SUV’s. We not only offer extensive experience in our Boynton Beach window tinting trade, but also a long track record in quality control and customer satisfaction. Our window tinting skills and tools are sharp enough to provide a job that’s even better than what was expected. We are constantly improving and updating our window tinting workshop with the latest in tint application technology for our customers in the Boynton Beach area and beyond. Do you like the idea of being able to cool your house without adding a single extra cent to your air conditioning bill? 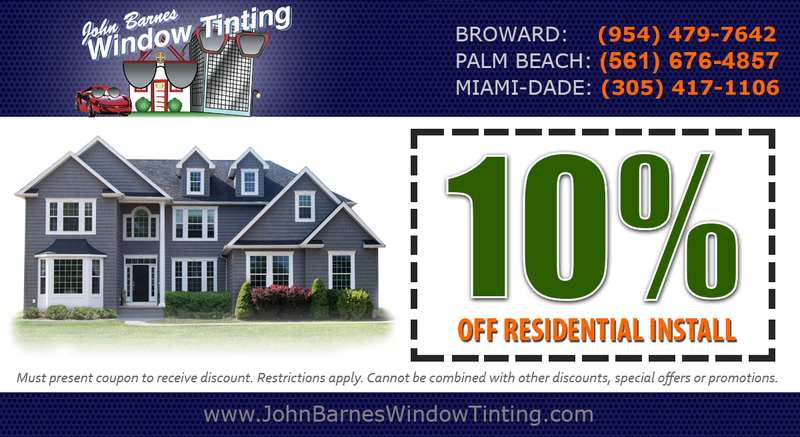 If saving money on air conditioning is one of your priorities, then home window tinting from John Barnes in Boynton Beach and the surrounding communities is exactly what you need. In addition to helping you cut back on air conditioning expenses, we can also reduce the sun glare by up to 85% with our American Standard Window Film (ASWF). Thanks to our top-notch window tinting, you’ll also be able to watch TV without any window glare interference. Our tinted windows provide you with equal amounts of privacy and convenience. If you live in Boynton Beach, Delray Beach or anywhere else in Palm Beach County, our window tinting can take your home security to the next level. With our affordable commercial window tinting rates in Boynton Beach, you can manage the major cost of opening a business. Our window tinting solutions not only optimize construction expenses, but also facilitate better interior cooling. We use only the best in American Standard Window Films. Along with an assurance of top-tier material, our Boynton Beach window tinting selection also provides you with an extensive range of choices in colors and tints. 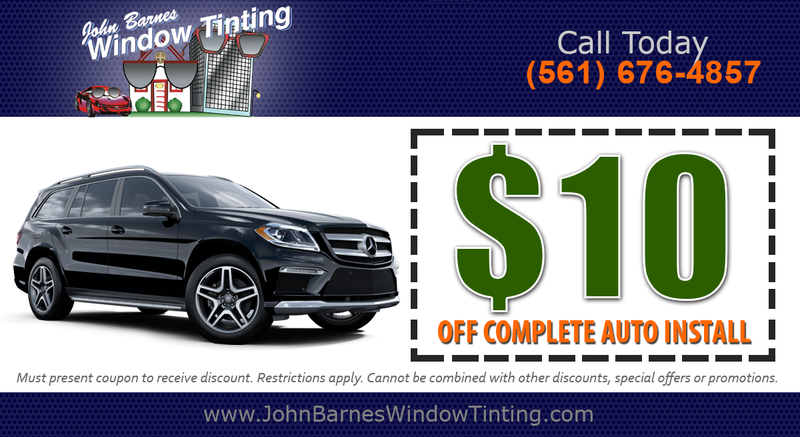 Investing in our high-value window tinting services for your Boynton Beach business is a great ROI. Call us for a cost-free, no-obligation estimate for your window tinting needs.